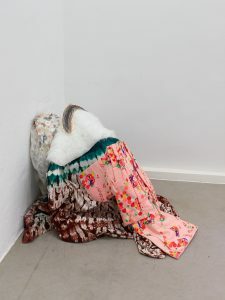 Isabella Fürnkäs’ process deals with the aftermath of a delicate identity crisis that cannot play nice anymore and has reached a boiling point making the need of pointing some fingers and raising some eyebrows even more demanding than ever. Communication practices, highly linked to a long one sided evolutionary history of western thinking, have been strictly canonized within a clearly defined language cosmos. Embodied identities and subject roles have for so long been diminished into nothing more than just a mere Epiphenomenon of human cognition; a world where the almighty power of the logos still rains with an iron fist, outranking the body, the space and the Machine. On the forefront of post-internet art and the unavoidable perplexities of a digital revolution the way we communicate information follows a chaotic, almost untraceable pattern. The minute you think something is there, it quickly vanishes into nothing but thin air. Fürnkäs manipulates those moments of fragility around themes of human communication and presents a new take on the dialectics of bodily conditions, human mind, language, motion, space and the nothingness lurking underneath. The construction of the Other, understood as a differentiated Self, becomes a vital component of the piece; a text written in manner resembling a monologue, and yet performed by two individual bodies, in such a way, so that the speech acts and embodied identities, all end up interacting with one another. In other words: there is no “I” of a strong and definitive one performer to be found, but an intricate assemblage of scattered structures waiting to come alive. The Nike Billboard stares right back at me.